It’s a shame how much waste most of us accumulate over the course of a year. Running a modern home and taking care of our families demands that we buy things, get rid of things and repeat the cycle. Often, whether because we are unsure of what can be recycled, or how to extend the useful life of something, our junk ends up in the trash, which is bad for the environment and our ecological footprint. Below are five ways to reduce junk at home by recycling. If you find yourself with a surplus of plastic grocery bags (as most of us unfortunately do) you can check and see if your local grocery store has a plastic bag recycling program. You can also use old plastic bags as garbage bin liners, to pick up dog poo, as wrapping for things you are shipping, or, if you’re out of plastic wrap, to store fruit and vegetables in. If recycling day has come around and there is no more room for those extra milk cartons in the recycling box they can always be repurposed. Cut off the tops and use them as a planter, or, if you are planning on taking the cooler somewhere, you can fill them with water, freeze them and use them as ice blocks. Plastic water bottles are a huge offender when it comes to environmental pollution, so properly recycling them, or reusing them is incredibly important. If you like to garden, you can cut the bottoms off of plastic water bottles to create containers for seedlings. They can also be turned into coin storage containers for your kids. If you are unable to recycle an ice cream container right away, it doesn’t matter, they are useful for so many different things. If you need something to store garden tools: empty ice cream container. If you are going to the beach and want to build some sandcastles: empty ice cream container. With an empty deodorant stick, you have a perfect arts and crafts tool for the kids. All you have to do is remove the ball, give it a wash, fill the container with paint and replace the lid and you’ve got a fun painting tool for the kids arts and crafts. All it takes to get more out of things you’ve used up around your house is a little inventiveness. 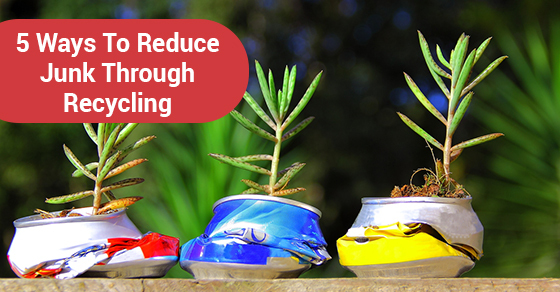 If you find that you are at a loss for how to go about recycling common things around your house, keep the above tips in mind and minimize your environmental impact while using your imagination.